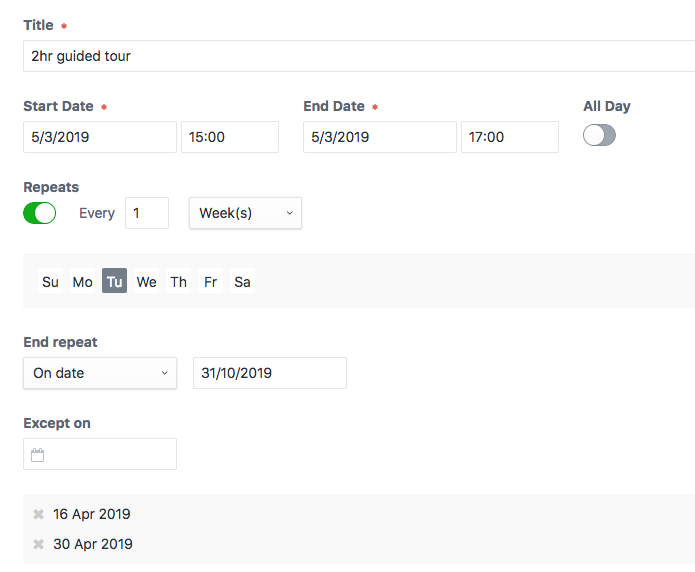 We need to build a ticketing system for venue tours, that happen every week within certain date ranges, and with an option to exclude specific dates from the availability list. (1) Recreate this setup as fields on a Commerce product . (2) Create a relationship between a Solspace Calendar event and a Commerce product (that only allows for a certain number of products to be sold for each date in the calendar). I think you will have to get your hands a bit dirty with this one. The Calendar Events fieldtype will get you part of the way, but you still need some module code to pull this off. Create some module code that creates/updates a product + variants for each date, where the inventory is set to n.
List the events as you would normally do, and pull in the products and its variants with the reverse relationship. If the available number of tickets is always the same, you could have one field on the event where you enter the number. If the amount of tickets vary by day, there is probably multiple approaches. Maybe a Matrix field that assumes position of block with quantity field === date in same position/with a date picker, maybe something else. Not the answer you're looking for? Browse other questions tagged craft3 events plugin-craftcommerce2 plugin-solspacecalendar tickets or ask your own question.